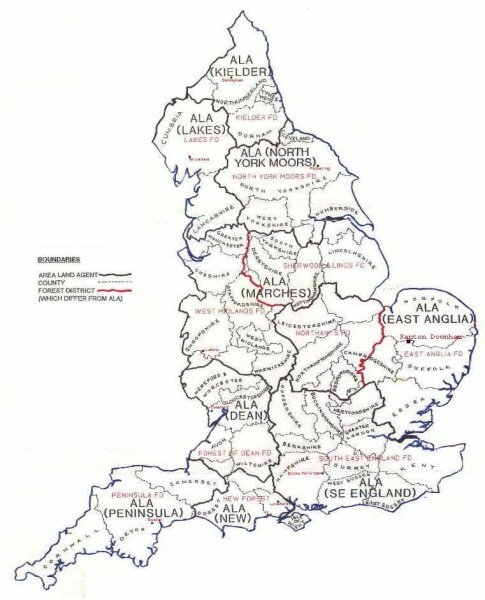 If you look at a Forestry Commission map of key spots in England, you might be surprised to see that Santon Downham is marked instead of cities such as London, Norwich, Cambridge or Ipswich. But the tiny village is the hub for all forestry activity for a huge area stretching from North Norfolk right down to East London. Over 20,000ha of Thetford Forest are managed from the purpose built 1960s office complex in Santon Downham, base to 95 staff . The village’s development in the 20th century has been shaped to a large degree by forestry, right from the 1920s when the run-down Downham Estate was bought. The landscape around the village evolved as the planting of Thetford Forest took hold New houses were built by the Forestry Commission, and occupied by its staff, and even the drinking water was provided by the Commission until 1998. These days, few of the people who live in the village are directly employed in forestry, but it continues to have a major influence on the local economy, the local landscape – and even local gardens, as it provides the timber for much of the fencing and decking found in the garden centres and DIY stores around the area. Timber worth in excess of £4M is harvested from Thetford Forest each year. work our operational methods to suit desired management objectives. The forest has a diverse range of nationally rare plants and animals. Some areas are already designated as SSSIs for their wildlife interest and much of the forest is within the Brecks Proposed Protection Area due to high levels of two breeding bird species, the woodlark and the nightjar . These two heathland birds breed on areas recently cleared and replanted and their numbers have rapidly increased over the last 20 years. The forest also has many scheduled and unscheduled ancient monument from round barrows to flint mines and Roman villas. All of these interests will be taken into account during the forest design plan process. Introducing more broadleaf varieties is not always appropriate; many types would not thrive in the sandy soils of the area. More broadleaf trees will be planted where the habitat is suitable – the idea is to provide a diversity of species. Most of the trees planted in the Forest are grown in Forest Enterprise’s nursery at Delamere, one of three in the country. 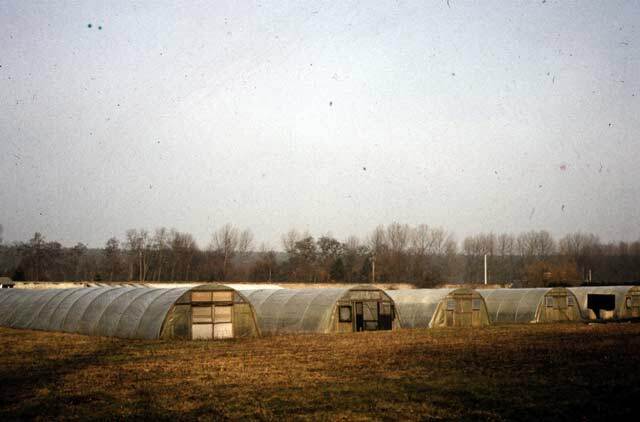 Santon Downham used to have its own nursery, but it was closed in 1991 and production was moved to Delamere where investment in growing trees could be focused in a single location. The balance between recreation and conservation has to be maintained. Whilst encouraging visitors on foot, bicycle and horseback to use the miles of forest tracks, the interests of wildlife such as the red squirrel need to be considered. The High Lodge centre – which lies within the boundaries of Santon Downham – has over 150,000 visitors a year and has a range of facilities including adventure play areas and a maze. It is also used for open air concerts during the summer . Adjacent to the visitors centre is the red squirrel conservation area where specific woodland management maintains the best possible habitat for these elusive and increasingly rare animals. “Listening to the needs and aspirations of the community and our customers is a very important part of the planning for the new design,” says Mr Lyon. The process of redesigning the forest started some 10 years ago – a revision is now under way. International, European and British policies and thinking feed into the process. “Before we fell, we are planning 25-50 years ahead,” he adds. Consultation involves local authorities, English Nature, customers and the regulatory and advisory side of the Commission. Design plans will be shown through public roadshows. “This is not a fait accompli,” emphasises Mr Lyon. He also welcomes the involvement of the Friends of Thetford Forest, an enthusiastic volunteer organisation, which is increasing in strength and gives a very good sounding board. “They speak their minds, which is excellent,” he says. Timber from Thetford Forest goes to many different markets including construction, fencing and pallet manufacture. Smaller diameter material is used in the manufacture of chipboard. Fencing is the most important market locally and the popularity of timber products such as decking is also clearly evident as a visit to most garden centres will reveal. Both Jeffrey Walker and MR Ellis supply sawn timber into the market place as do a number of smaller mills in the area. For many of these customers it is important that they can trace back the source of supply to a well managed, sustainable woodland. All Forestry Commission forests have recently received accreditation under the UK Woodland Assurance Scheme. This scheme audits all aspects of an owner’s management of its woodlands, taking into account a whole range of measures which demonstrate environmentally friendly and sustainable management practices. Staff based in Santon Downham carry out a multitude of roles – some of the men and women work as recreation or conservation rangers, others deal with forest mangement, harvesting, marketing, administration, provision of roads or as mechanical engineers looking after the harvesters and vehicles. 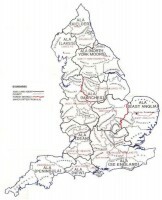 There are also staff at offices in North Norfolk, Sandlings, Lavenham and in the east end of London. In all, the region employs about 95staff – 90 based in the village – though contractors add to the numbers working in the forest. Santon Downham is the district office for an enormous area, stretching from North Norfolk to London, and therefore plans made in the village manifest themselves in developments far afield. An example of this is Forest Enterprise’s involvement in Thames Chase, a community forest to the east of London. Since April 1999 Forest Enterprise has been working with the Thames Chase team and local authority partners to develop new woodland on brownfield and agricultural sites. The 10 year target is to develop woodland over an area eight times the size of Hyde Park. This area of Thames Chase has suffered from industrial development and decline over the last century, and is one of three regions that will benefit from a £13M initiative, largely funded by the Treasury’s Capital Modernisation Fund and the Forestry Commission. The initiative will start to heal the environmental damage of the past and provide an improved landscape in which new businesses can invest. Work is already under way to turn old sand and gravel workings and landfill at Thames Chase into attractive woodland open to the public. Forest Enterprise, working in partnership with local authorities and the private sector, will develop the sites. Even before the first tree is planted, local people are getting involved, helping with a community consultation to guide the design of their future woodland. In addition to improving these sites for consultation, recreation is a major objective in creating these new woodlands. The new woods will provide the type of open access – walking, cycling and horse riding – enjoyed by visitors to Santon Downham. Whether Thames Chase also gets a visit from Thetford Forest’s husky racers remains to be seen. The buildings were praised in “The buildings of England – Suffolk” by Nikolaus Pevsner, published by Penguin Books. Most of the harvesting and extraction is carried out directly by Forest Enterprise staff, delivering it to the roadside for haulage contractors to take away. In some areas, the fungal infection Heterobasidion annosum means that stumps need to be dug up to prevent the spread of infection which would create a rot within growing timber. “Our own men and women are involved in the removal of the stumps and the cultivation of the ground and the preparation for the new young trees,” explains Mr Lyon. Several of the key sawmills that take the timber are in East Anglia, but there is also a major customer in South Yorkshire. The business there used to be in supplying timber for mining, but structural timber and fencing have now taken over. Although much of the forest’s timber goes for fencing, some of it is capable of higher grade uses such as roof trusses, says Mr Malone. Every part of the tree is used, and trees of all sizes have a market. The smallest diameter trees can be used for round fencing, or may go to the chipboard factory. Paper isn’t made from the forest’s trees however, adds Mr Malone. The transportation distances are too great, and spruce is preferred for paper because of its longer fibres. Some of the waste from the timber felling is also used as fuel in the innovative biomass power station a few miles from Santon Downham. Branches, needles and twigs are chipped by a local firm, and sold for mixing in with other fuels such as the litter from chicken farms. 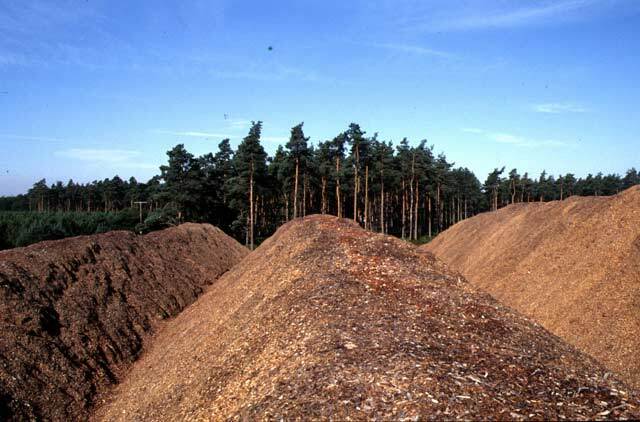 Heaps of chippings can also be seen all over the forest – these are left to compost down as mulch for gardening, or to be partially seasoned prior to their use as power station fuel. 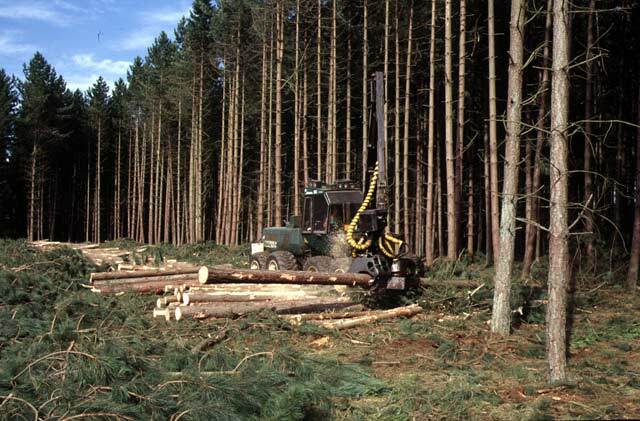 Forestry involves waiting many years before the timber can be harvested. 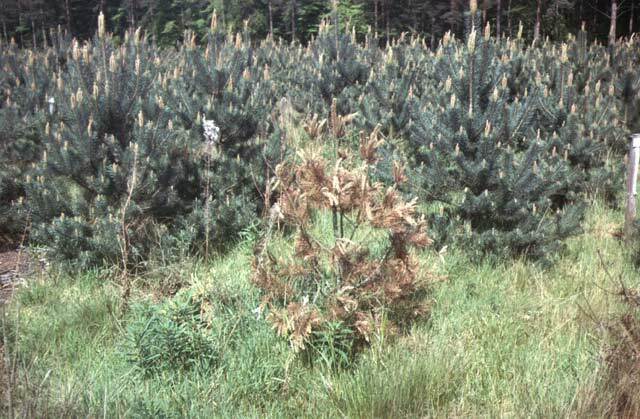 The rotation period for the softwood pine trees in Thetford Forest is about 50-55 years. “We are still dealing with a significant amount of clear felling from the first rotation of crops,” explains manager Simon Malone. These trees were all planted over a short period, and Forest Enterprise is developing a more even age structure for the forest of the future, so that trees come to maturity at a steady rate. This will ensure that timber supply in years ahead is sustainable, meets the needs of the customers and allows them to plan ahead. It also ensures a steady income stream for Forest Enterprise. Trees are measured in yield classes – the widely grown Corsican Pine has a yield class of 16, meaning that over its rotation it can produce 16m3 of new timber a year from a hectare. The once more commonly grown Scots Pine has a yield class of 12. There is an optimum time for felling a block of mature trees and putting new ones in their place. This is because the rate of growth slows as the trees get older, making it more efficient to fell them and to replant a successor crop than to leave them growing. Timber comes from thinnings as well as clear felling, explains Mr Malone. A hectare would generally contain 2,200 young saplings. Eventually they start to fight for space. The right time to start thinning them is at about 25 years – they are big enough to have a commercial value by then, which means that the operation can be carried out with a small profit. By the time the trees are ready for clear felling, aged 50-55, there will be 500 giants left per hectare, says Mr Malone. Hardwoods make up about 15% of the forest’s area, and one of their uses is as firebreaks – though of course they also have landscape and wildlife value too. The wait for harvesting them is even longer than for the pines – typically 120-140 years. About 70% of harvesting is carried out by Forest Enterprise’s own staff – the rest is “sold standing”, meaning that someone buys the timber standing and makes their own arrangements to harvest and market it. 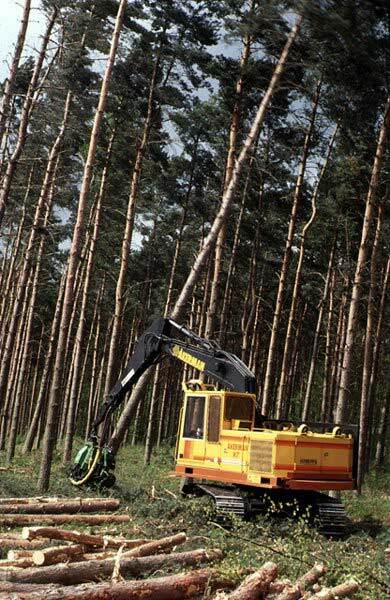 Forest Enterprise harvests about 110,000m3 a year itself using machines called harvesters. Another 30,000m3 is cut down by chainsaw, for example where it is in a particularly environmentally sensitive area. Commercial sales of timber are carried out by two tenders and one auction every year. Trees are only felled to suit the rate the customers need the timber. It is safest left growing until required, particularly in summer. Otherwise it can soon become stained blue through a fungal attack. Structurally it is fine even with this, but is off putting to purchasers of the finished product. Thetford Forest has been captured on a geographical information system, explains planning forester Richard Brooke, who is based in the district office in Santon Downham. The GIS system now allows the maps of the area to be tied in to databases that hold all the information – time of planting, planned harvesting dates and so on. Staff can click on a part of the forest and call up all the relevant information. “It needs to be kept up to date, so that we can tell where timber has been felled for instance,” says Mr Brooke. It has been a time consuming and painstaking process creating and verifying the system and involved bringing together many sources of information. The maps can be viewed at any scale, and the level of detail can be varied, so that people can chose to view where power lines are, or fire breaks or blocks due for harvesting next year and so on. 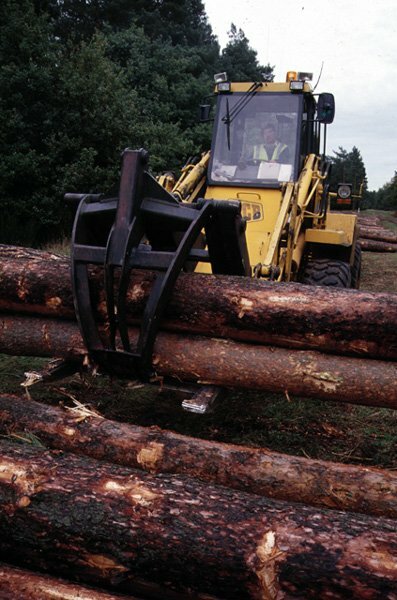 The system also plays an important part in the records needed for the accreditation under the UK Woodland Assurance Scheme – Forest Enterprise has to be able to demonstrate that the timber supply is sustainable. Friends of Thetford Forest Park was inaugurated in 1995. Its aims are to increase knowledge, understanding and enjoyment of Thetford Forest Park, as well as to encourage involvement of the local community. Whilst The Friends share many common interests with Forest Enterprise, it remains independent, serving the needs of its members and acting as the eyes and ears of the forest. In recent years, The Friends have not only been successful in increasing membership numbers, but have worked hard at organising numerous events for the enjoyment of all the family. Recent activities have included a trip to the restricted military battle training area, known as STANTA, just outside Thetford. Other activities have included conservation work such as fencing and repairing bat boxes . Members also receive newletters, forest events programmes and are entitled to reduced price season tickets for car parking at Forest Enterprise sites. Friends of Thetford Forest have their own website.